Although the fourth pylon was constructed by Tuthmosis I, of sandstone faced with limestone, the restoration texts on the outer face are of Tuthmosis Iv, Seti II, Shabaka and Ptolemy VIII. It stands in front of a narrow transverse hall built by Tuthmosis I or III, now with 14 papyrus columns although probably originally 16. 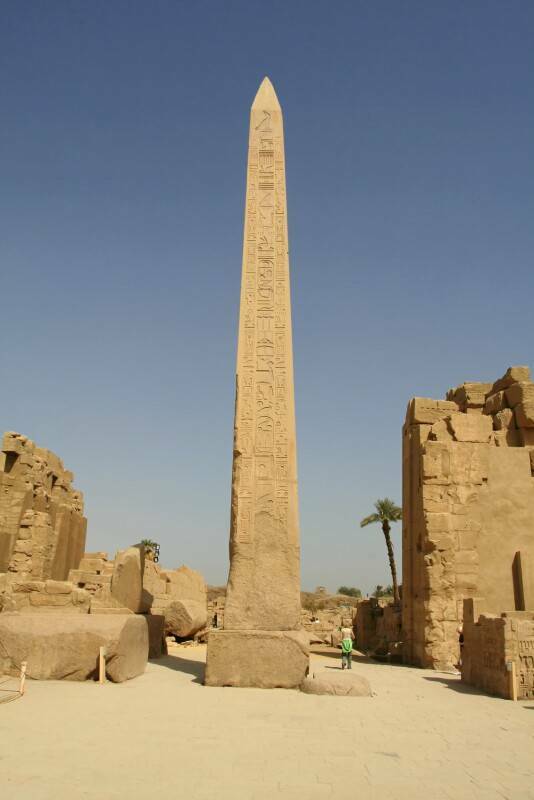 Hatshepsut had two obelisks erected, one each side of the passageway. Only the north one is still standing (24.5m high, 320tons) the blocks of the south obelisks are lying in the court with the pyramidal cap removed near to the lake. These two obelisks are depicted in the transport from Aswan to Thebes on the lower terrace at Air of Bahri. 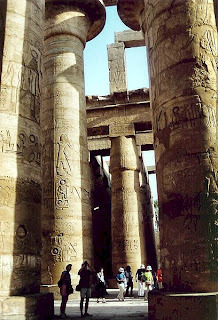 They are dedicated ti Amon, presider over Karnak and lord of Thebes. Another inscription quashes and insolent inquiry from the future as ti their purposes thus:" O ye people who shall see this monument in after years and tho shall speak of that which I have made, beware lets you say" I know not why it was done? "I did it because i wished to make them as a gift for my father Amon, and to gild them with electrum. Passing beyond Tuthmosis I's fifth pylon and the sixth pylon of Tuthmosis III we reach the courtyard in front of the sanctuary. This was the holy of holies the place where Amon dwelt and where the great god revealed himself in the course of every day. 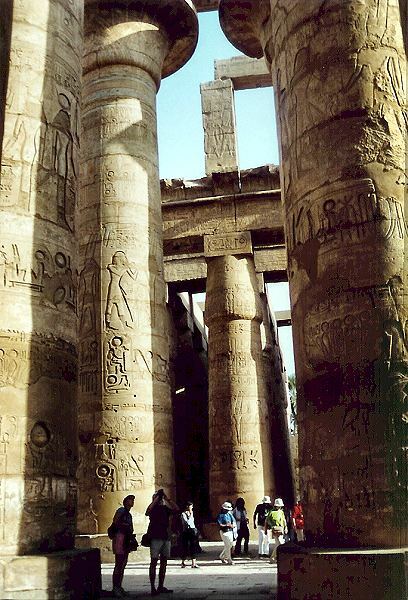 The symbolism of the two heraldic columns in front of the sanctuary - carved with the lower Egyptian louts (north) and the papyrus of Upper Egypt (south) a, thus expressing the union of the two lands before Amon- is surely deliberate. Note also, at the north end of the court two large statues of Amon and his consort, which were dedicated by Tutankhamen when he restored the full panoply of the old religion following the Atenist heresy. The granite shrine of Amon was built in the a name of Philip Arrhidaeus, the half-brother of Alexander the great who was acknowledged as king of Egypt between Alexander's death and Ptolemy I's final seizure of power . Replacing and earlier shrine of Tuthmosis, it is internally divided into two rooms: the front was the shrine proper, where the god's statue was kept and where the daily offering ritual took place. The portable barque of the god rested on the pedestal in the inner chamber the walls are covered with scenes illustrating episodes of the offering rite , with Amon appearing in his usual anthro pomorphic guise and also the ithyphallic from he shares with Min, the god of fertility. The exterior walls of the sanctuary are brightly painted (especially on the south side) : from the suite of rooms just south of the sanctuary of he scenes showing the progress of the rituals during the annual feasts. Note also, on the offering scenes to the right that the painted grid used to place the text and figures on the wall before carving is still preserved. A gridle wall built by Tuthmosis III surrounds the area and beyond the east wall is the east sanctuary if Amon Rebuilt by Hatshepsut, cut from a single bloc of alabaster, is flanked by two lateral rooms and entered by vestibule. On either side are the pedestals of two obelisks raised by Hatshepsut, of which nothing else remains. The seventh pylon built buy Tuthmosis III is decorated with the usual victory scenes with the names of conquered districts and the kings killing the enemies before Amon , The doorway of the granite capped with and alabaster lintel has been destroyed and the pylon has to be passed to the east. immediately inside the second court are two colossi, to the west Ramses III and ti the east Tuthmosis III ( upper sections destroyed) beyond is the base of and obelisk of Tuthmosis III; the base of an obelisk of Tuthmosis III; that corresponding on the west was removed by Byzantines and still stands in Istanbul. Off this court to the east opened a small granite chapel of Tuthmosis III (very ruined) the interior texts mention the king's festivals and there is an alabaster shrine with a dedication text (Tuthmosis's statue and Sphinx from here are in the Cairo Museum). The Eighth Pylon was raised by Hatshepsut but the car-touches have been altered. The name of Amon was erased by Akhenaton and re[laced by Seti I who added his own car-touches. Seti I and Tuthmosis are seen on the reliefs instead of Hatshepsut. The clear traces if burning in this Pylon probably derive from one of the sieges that destroyed Thebes. The doorway shows Tuthmosis II to the east of the last two courts is the sacred lake. We come now to two more Pylons the ninth and tenth, which Horemheb built block from the local Atenist temples ere used to fill their interiors and it is planned to consolidate these buildings, once their contents have been removed. 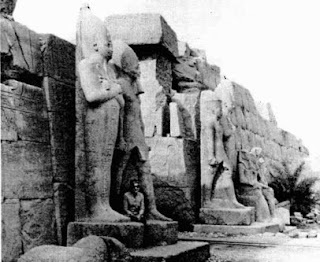 Two limestone colossi (probably of Horemheb) flank the gate that leads out towards the precinct of Mut. On the east-side of the court is a small chapel commemorating Amenhotp11's jubilee, restored after the Amarna period by Sety1. The south-west corner if Amon's precinct is reserved for the temple of Khonsu, a moon god who forms the third member of the Theban Tried. The columned court inside is earlier, dating the reign of "King Herihor", who officiates in countless offering scenes in conventionally royal fashion m the hypostyle hall beyond dates to a precious stage of Herihor's career, when he was still only high priest of Amon under Ramses XI: the protagonist in most of the scenes in this hall is the King, but Herihor appears in two important reliefs flanking the doorway on the north wall, in which her usurps the King's pace in the making offering before the barque of the Theban triad. The interest of this building lies party in its state of preservation, for it is a food example of a smaller temple of the late new kingdom, but it also reflects some of the conflicts they brought and end to the Ramesside age, the Pylon was decorated during the pontificate of the high priest later " king Pinedjem" I, in a style they only stops short of claiming royal status for its outer.